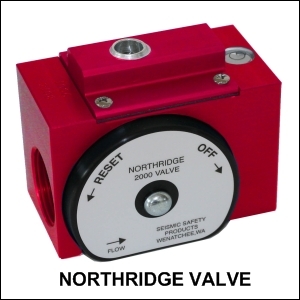 The Northridge 2000 valve is a simple patented design with only one moving internal part. A stainless steel ball rests on a pedestal inside the valve when it is in the ON position allowing gas to flow. During a seismic disturbance of approximately 5.2 or greater on the Richter scale, the stainless steel ball falls from the pedestal and plugs the outlet passage stopping the flow of gas. The gas can only be turned back ON by manually resetting the valve. The faceplate has a magnet concealed behind it that lifts the stainless steel ball back onto the pedestal when it is slowly rotated one full turn counterclockwise. The Northridge earthquake on January 17, 1993 was 6.7 on the Richter scale. 72 individuals lost their lives. 11,846 inured. Over $25 billion dollars in damage. 114,039 buildings damaged. Over 12,500 after shocks, ten of which were over 5.0 on the Richter scale. 185 mobile homes burned from gas fires. 700,000 claims filed with F.E.M.A. for gas appliance damage. Up to 50% of post earthquake fires are caused by gas leaks.